There were 703 press releases posted in the last 24 hours and 153,525 in the last 365 days. NEW YORK, NEW YORK, USA, March 5, 2019 /EINPresswire.com/ -- North/South Consonance, Inc. celebrates St. Patrick's Day with a free-admission concerts to be held on Sunday afternoon March 17 at 3 PM. The North/South Chamber Orchestra under the direction of Max Lifchitz will perform music by composers hailing from Australia, Ireland and the US. To be heard for the first time in New York City will be music by Ireland's Frank Corcoran; Australia's John David Little, as well as Americans David Froom and Heather Niemi-Savage. 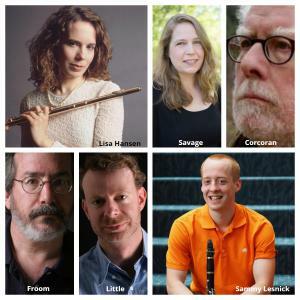 Flutist Lisa Hansen and clarinetist Sammy Lesnick will appear as soloists. accessible. No tickets or reservations needed. 'It soared a bird' from Mr. Bloom's orgasmic shout in his Ulysses." Born in Tipperary in 1944, Corcoran is a founding member of Aosdana, the Irish Academy of the Arts which honors artists whose work has made an outstanding contribution to the arts in Ireland. The recipient of a Fulbright Scholar Fellowship he has lectured at several US universities including CalArts, NYU and Harvard. The concert will honor the composer on the occasion of his 75th birthday. David Froom's Petali di Gelsonimo (Jasmine Flower Petals) for flute and strings was commissioned by China's Fudan University and premiered last year in Shanghai. It takes its title from the Chinese folk song Jasmine Flower used as basis for the work. Froom writes that Chinese melody -- also used by Puccini in his opera Turandot -- is first "broken" into small motivic fragments (as if picking petals from this Jasmine flower) and as the music progresses the petals are "reassembled" into the full flower. Froom teaches at St. Mary's College in Maryland and has received honors from the American Academy of Arts and Letters, the Guggenheim, Fromm, Koussevitzky, and Barlow Foundations, and the Kennedy Center Friedheim Award. Jonathan David Little's Sacred Prelude is a haunting, single-movement work for string orchestra. The Australian composer describes the work as "a poignant prayer for strings" as it was inspired by Gregorian Chant and evokes the sound of ancient church music. Little's musical style has been described by the European press as ecstatic minimalism and antique futurism. Little attended the University of Melbourne and holds the degree of Doctor of Philosophy in music for his research at Monash University into the development of "exotic" 19th- and 20th-century orchestration, and has written and broadcast extensively on this, and related topics such as songwriting and composition. Heather Niemi-Savage's Daughter of the Stars for string orchestra was inspired by the American folk tune Shenandoah. The title comes from the meaning of the word Shenandoah, which is "spruce stream, great plains, beautiful daughter of the stars." The folk song refers to a river, so while writing the piece the composer imagined traveling down a river and seeing the beautiful countryside surrounding it. Niemi-Savage's style has been described as "stunningly resourceful with scant material, exploring the interaction between the old and the new, tradition and innovation." Her works have been performed throughout New England and at festivals sponsored by the Christian Fellowship of Art Music Composers. Flutist Lisa Hansen's critically acclaimed EMI/Angel recording of JoaquÍn Rodrigo's Concierto Pastoral with the London Royal Philharmonic Orchestra has been broadcast worldwide. The New York Times described her playing as "irresistibly lyrical" while Fanfare proclaimed: "One might well prefer Hansen to Galway." She has performed and recorded with North/South Consonance since 1988 and is the featured soloist in several North/South Recordings including Harold Schiffman's Concertino for Flute and Strings, Stephen Yip's Shun and Robert Martin's One Year the Milkweed. A graduate of The Juilliard School, Ms. Hansen is now the flute professor at Kean University. Clarinetist Sammy Lesnick won the 2013 Eastman Clarinet Concerto Competition. He was also awarded first place at the Washington State solo competition in 2012 and in the same year won the Seattle Symphony Young Artist Competition, performing the final movement of Weber's Concerto No. 2 with the orchestra and conductor Ludovic Morlot. His passion for new music has brought him to performances in St. Louis with Alarm Will Sound, in New York City with Ensemble Signal, and at venues in Italy, Spain, and Greece. He performed Steve Reich's New York Counterpoint to a full house at Eastman's Kilbourn Hall with the composer present, followed by a repeat performance at the Kennedy Center in Washington, DC. Since its inception in 1980, the North/South Consonance, Inc. has brought to the attention of the New York City public over 1,000 works by composers hailing from the Americas and elsewhere representing a wide spectrum of aesthetic views. Its activities are made possible in part, with public funds from the New York State Council on the Arts and the New York City Department of Cultural Affairs. Additional support provided by the Women's Philharmonic Advocacy, the Music Performance Trust Fund as well as the generosity of numerous individual donors.